It is almost impossible to explain the beauty of Island Pag..the stunning colours of nature..of stone, sea and sky…seemingly a wasteland, weathered by the gale force Bora winds of winter…yet here we find the finest wines, internationally acclaimed sheep’s milk cheeses, succulent lamb dishes, 1000 year old olive groves, and the most exquisite handmade laces. … a most exotic environment. My friend from Rome, Rachel Rennie came to visit me in July, and after showing her around my home town of Split, it was decided to head north to Zadar, and a further 16 kms to the bridge of Pag… Driving from Split up the A1 highway to the turnoff at for Island Pag took us through the Dalmatian Zagora, the inland region of Dalmatia spreading from Zadar to Biokovo mountain near the Makarska Riviera and Šibenik-Knin regions. 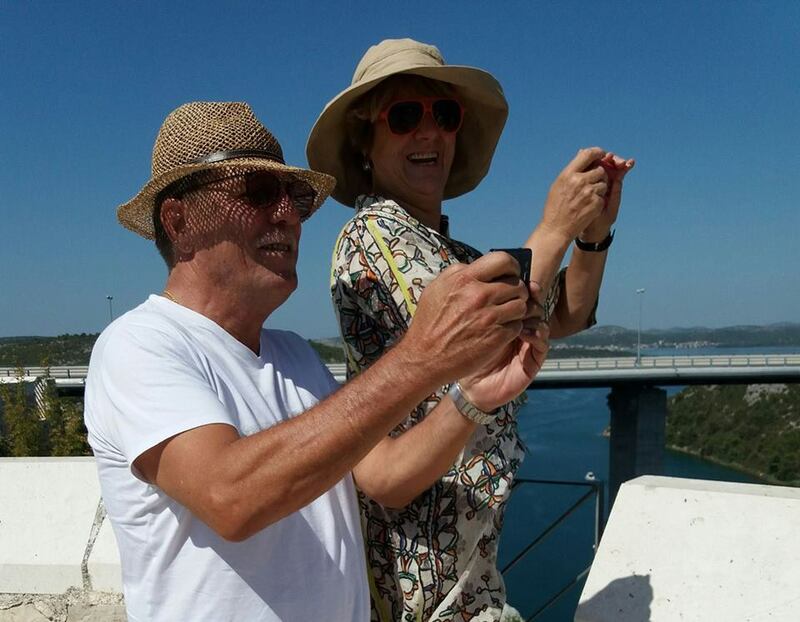 Stopping at the scenic lookout overlooking the River Krka, we marvelled at the view of Skradin nestling in the bay across the water..
Rachel and Duško at the Skradin view point on River Krka.. Arriving on Island Pag is breathtaking! 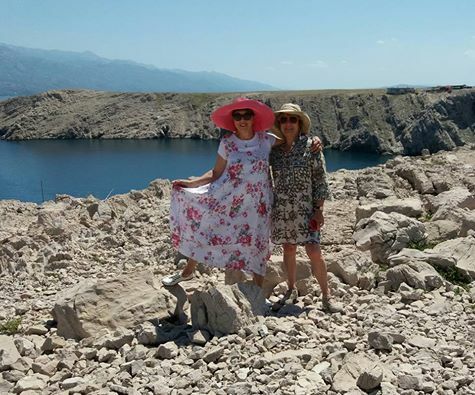 Thanks to the strong bora wind blowing from the Velebit mountains the island resembles a moonscape. But this is not the only thing you will find. The island is quite intriguing ..if you drive around for one hour , you will see fantastic beaches, old olive groves, Mediterranean pastures, fertile fields, vineyards, and thick forests! 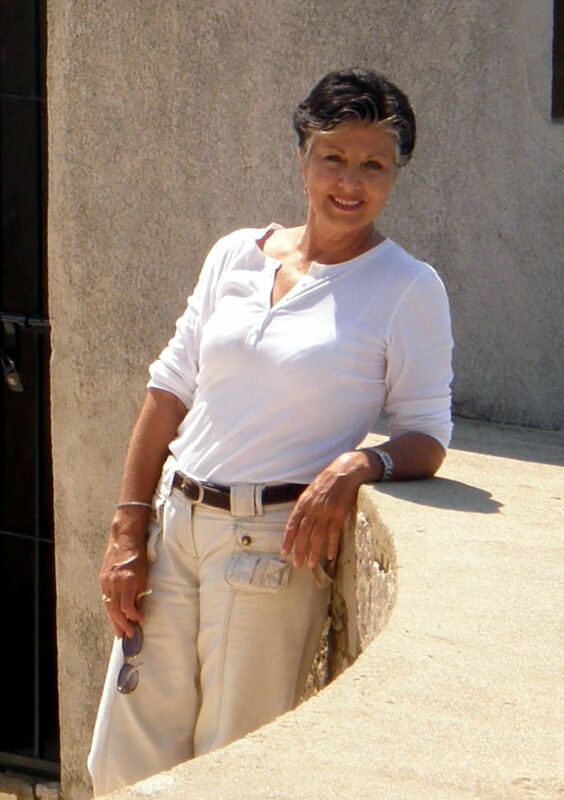 This is an island of great contrasts that offers great cuisine, and fascinating culture. 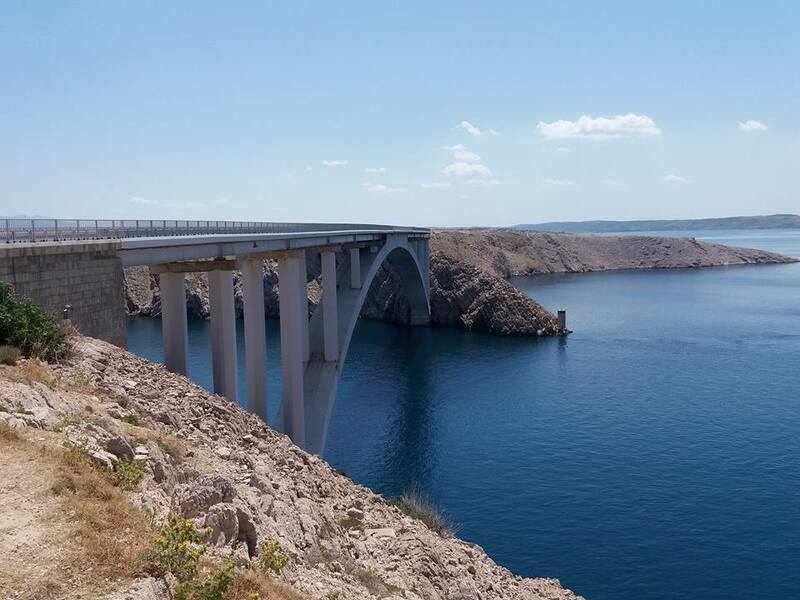 The Bridge of Pag (Paški Most) connects the mainland with the Island..It played a strategic role in the recent Homeland War of 1991…. 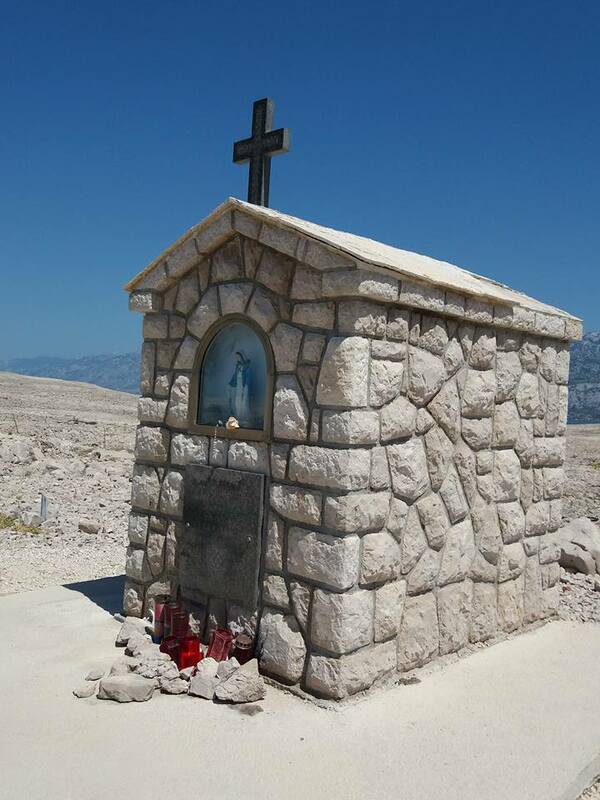 We stopped to reflect upon the hardships endured by the people of Pag over the centuries, yet a place they called home, proudly carving out a life of rich cultural heritage and traditions…..
At the Pag side of the Bridge is a monument to Mother Mary in memory of those who died in the recent 1991 Homeland War of Independence. Lace-making, the ‘white gold of Pag ’is hand made by local women. The roots of this craft are traced to ancient Mycenae and nuns in Pag Town who have preserved the tradition. 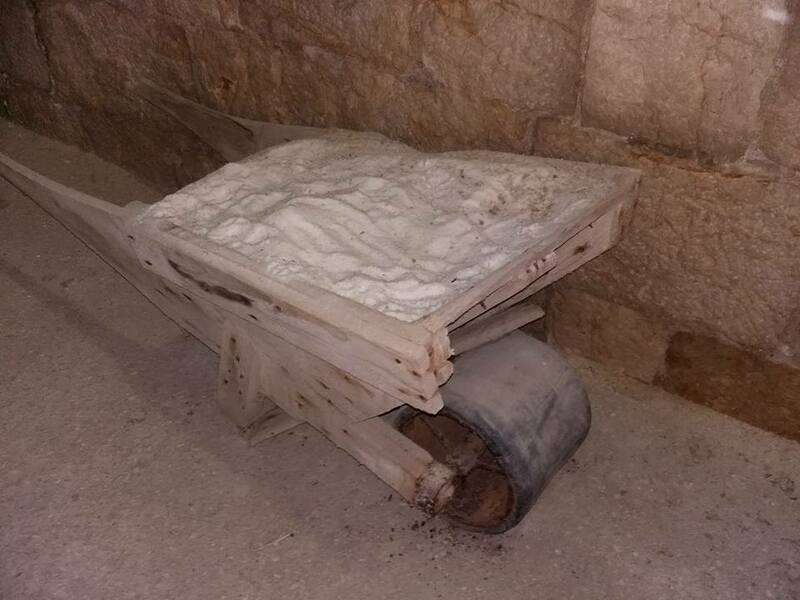 It is available for sale in front of the homes of lace makers in Pag Town. In the past it fascinated Empress Maria Theresa at the Austrian Royal Court in the 18th century and visitors to the 1939 New York World Fair. 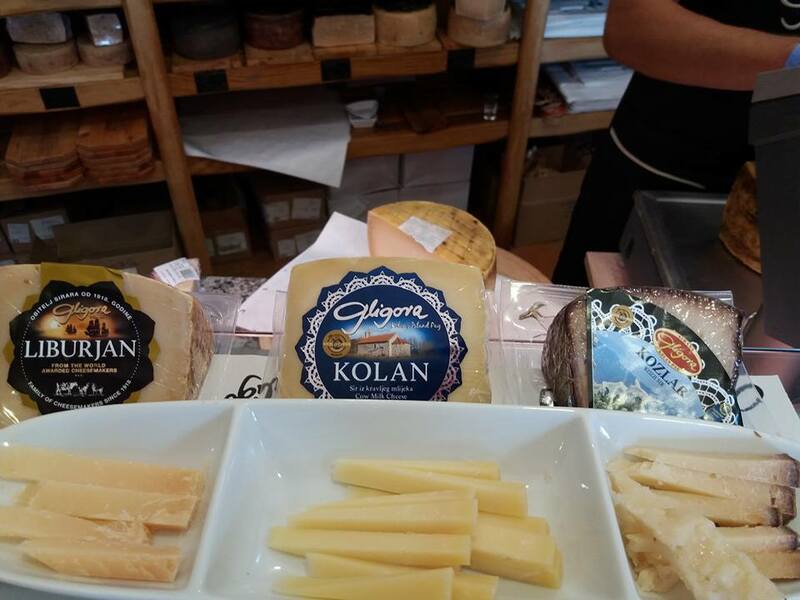 Internationally award winning sheep’s milk cheeses of Island Pag…. 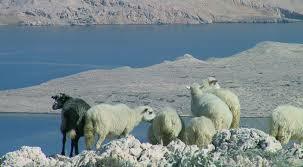 The hardy milk producing sheep of Island Pag. 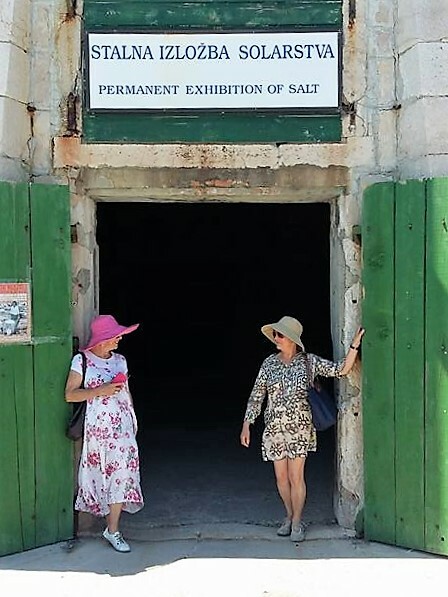 Saltworks at the Town of Pag…Learn about the salt trade from many years ago…Here we are, Rachel and myself at the Permanant Exhibition at the Saltworks Museum....The tradition of salt manufacturing has been a trademark of the island since the 13th century..
At the Saltworks Museum we met the delightful Iva Rumora. We paid our entrance fee of $2.50 AUD and were totally captured by Iva’s unexpected commentary, telling us the historical story, interwoven with facets of interesting facts…A young woman of Pag who is obviously extremely proud of her island’s history and present day continuing development regarding the tourism industry and welfare of the people of Pag. 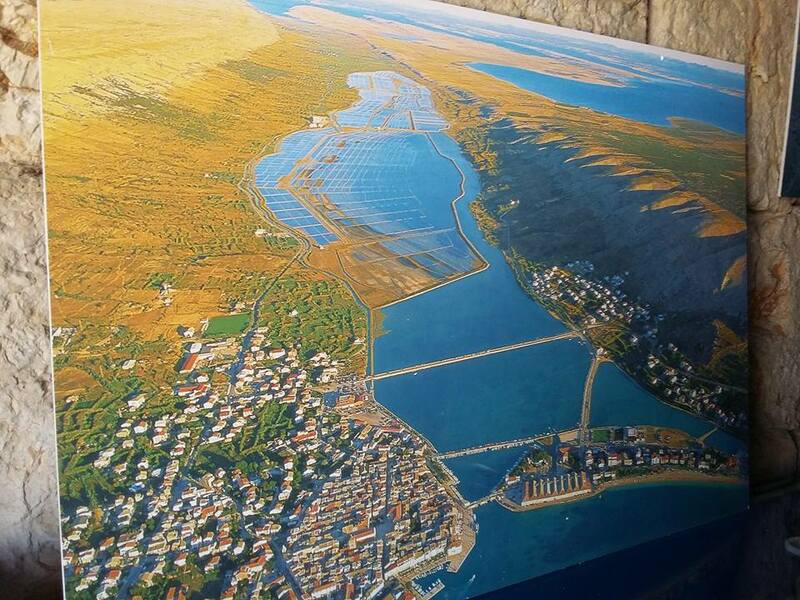 An aerial shot of the town of Pag and the nearby salt pans in the distance…salt was used as a valuable commodity, often being traded for freedom, property, and payment of services..it was controlled by the Venetian Empire for centuries. 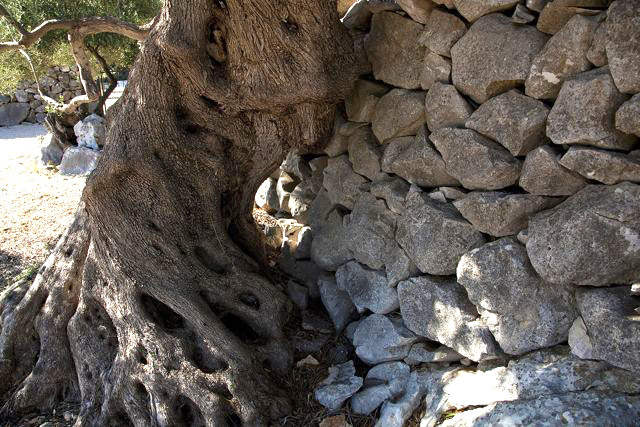 Equipment used in days gone by…..
Visit 1600 year old olive groves of Lun The Lun olive groves represent a true oasis and one of the most scenic and beautiful corners of the island. Among the countless olive trees, there are about 1500 wild olive trees – Olea Oleaster . The Lun olive groves represent a true oasis and one of the most scenic and beautiful corners of our island. 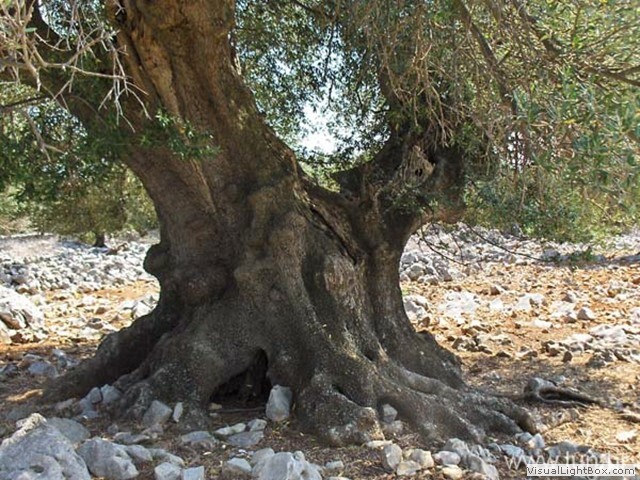 Among the countless olive trees, there are about 1500 wild olive trees – Olea Oleaster – measuring about 5-8 metres in height and about 20 – 80 cm in DBH. 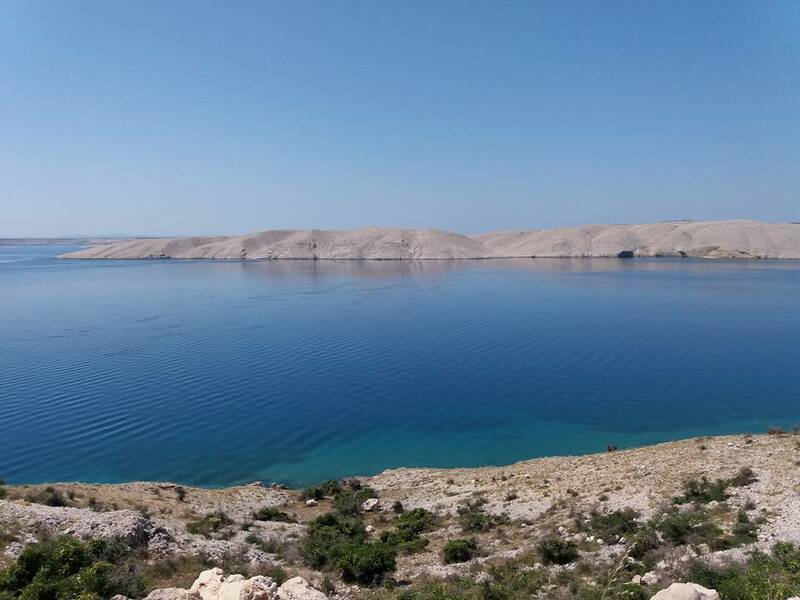 This area of wild olives, which covers 24 hectares of space, is the only one of its kind in the Adriatic Sea region and it has great botanical value. Due to its special characteristics, it was protected and proclaimed a botanical preserve in 1963. The Olive Gardens of Lun project commenced in 2010 and will be completed during 2013. 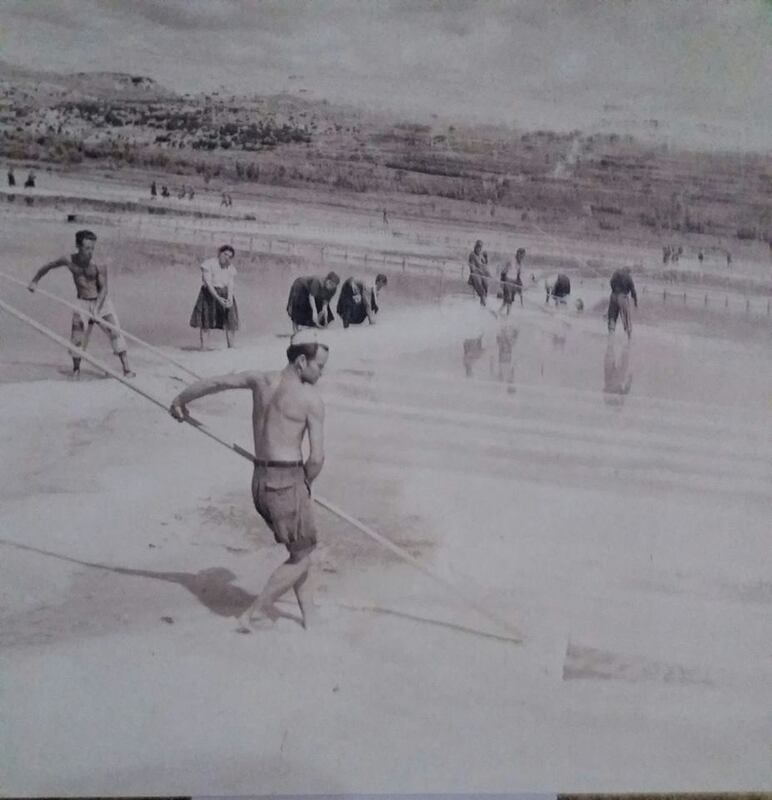 The aim of the project is to protect the natural and cultural values and to promote this unique landscape. 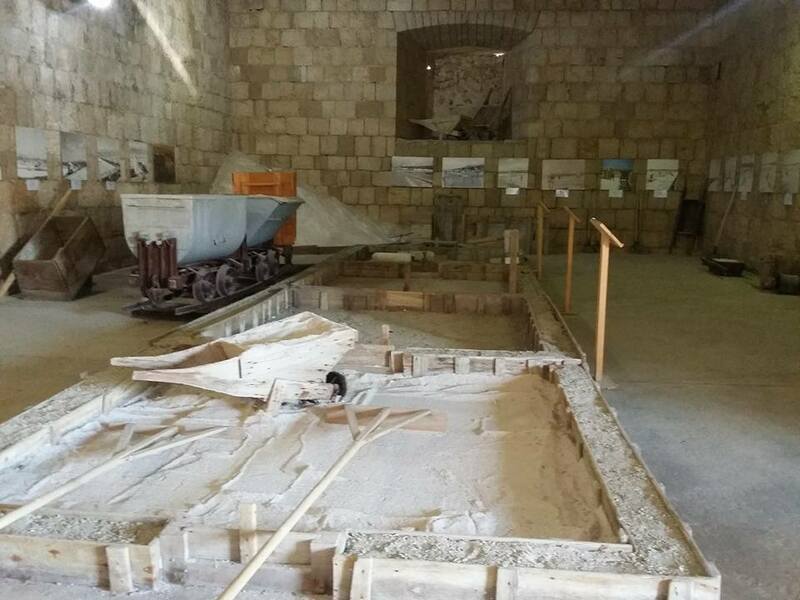 The Olive Gardens of Lun project is mostly financed by pre-accession EU fund grants. Urbanism The old town of Pag has streets aarrangedin the perfect order around the mainsquare. The pearl of the Renaissance architecture was largely designed in 1443 by Juraj Dalmatinac, the famous contructor of st. Jame’s cathedral in Šibenik. the arrangement of streets and houuses protects fromgusts of bora winds. 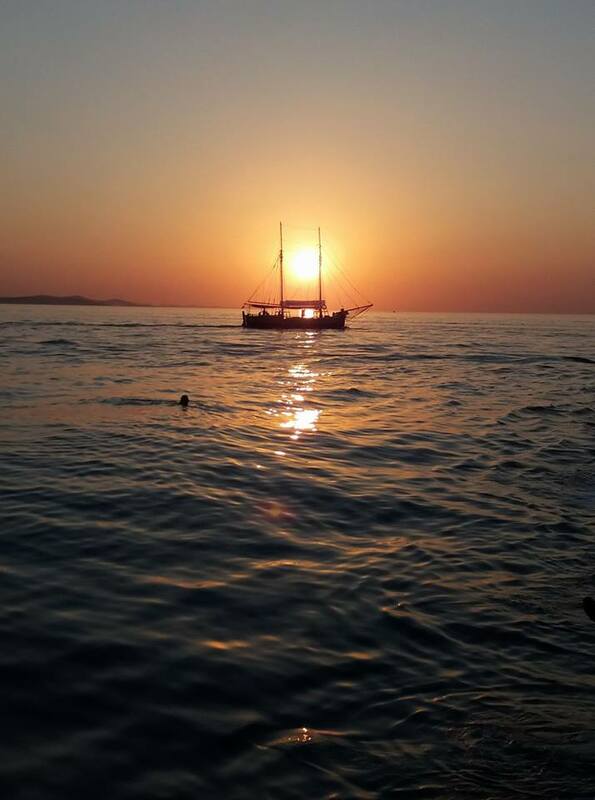 At the end of a perfect day, we drove back to Zadar to witness the setting sun . Joining hundreds of like-minded people we sat on the steps of the sea-organ listening to the haunting sounds of waves and wind creating a symphony of muted sea sounds…watching the sun dropping lower and lower to the horizon..golden and brilliant..sinking bit by bit until it slowly disappeared from sight…the crowd stood as if mesmerized..the final curtain was drawn and the audience clapped a rousing finale to the setting of the sun…. 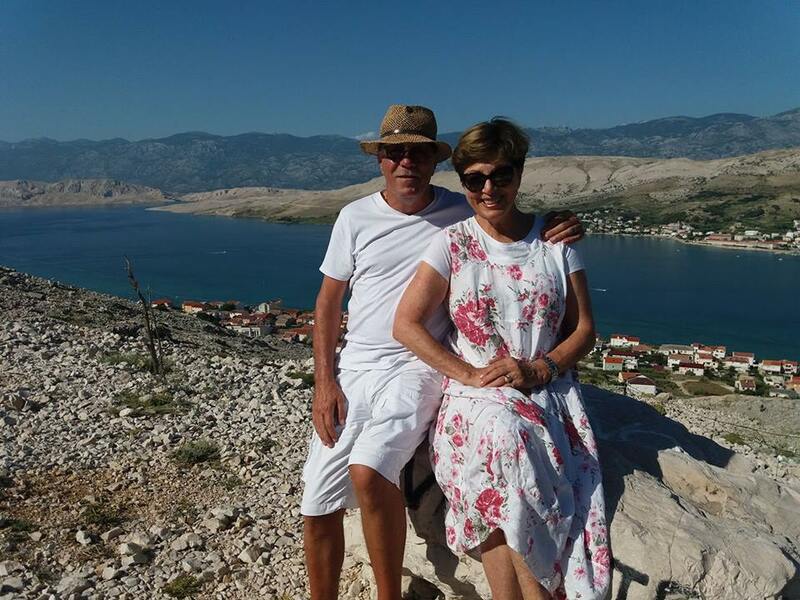 We love Island Pag…we will return again and again…!